The Scottish Government has been accused of “vanity publishing” after the release of a document outlining Scotland’s history with Europe. Liberal Democrat leader Willie Rennie described the paper as a “blinkered and selfish puff piece”, and he urged SNP ministers to focus instead on campaigning to keep the UK and Scotland in the single market. The document, intended for an international audience, sets out the “historical, political and legal reasons why Scotland’s voice needs to be heard following the EU referendum”. The Scottish Government has said it will publish proposals aimed at keeping Scotland in the single market, even if the rest of the UK leaves, in the coming weeks. Scotland’s Brexit Minister Michael Russell said: “Since the Scottish Parliament was re-established in 1999, the people of Scotland have exercised their democratic right to have a Government that represents their needs. “EU law stands at the centre of these arrangements, shaping the powers of the Scottish Parliament and providing rights to the citizens of Scotland. Mr Rennie said: “What the Scottish Government needs to do is bin the vanity publishing and get behind the campaign to keep the UK and Scotland in the single market and the EU. We do that by making sure people get a chance to vote on the final deal. 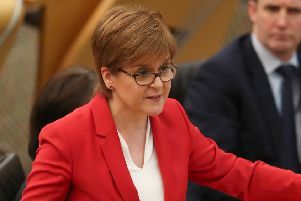 First Minister Nicola Sturgeon has confirmed the Scottish Government is considering a Norway-style model for keeping Scotland in the EU single market, with European Free Trade Association (EFTA) and European Economic Area (EEA) models being looked at. Former first minister Alex Salmond held informal talks on a visit to EFTA’s headquarters in Switzerland recently, according to BBC reports. Scottish Conservative finance spokesman Murdo Fraser seized on comments from Norway’s trade minister Monica Maeland, who told a meeting of EFTA ministers in Geneva that Scotland did not have the competence to join EFTA “as for now”. He said: “Norway’s trade minister has now joined many other European figures in pointing out that a deal like this is simply not going to happen. “And even if it were possible, the SNP Government itself said only two years ago that it would not be right for Scotland. “The UK has voted to leave the European Union and the Scottish Government now must engage with the UK Government in securing the right deal for all of us.